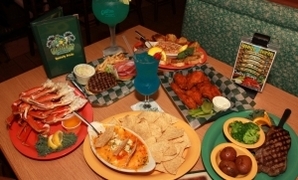 The best place to watch the Super Bowl on Clearwater Beach is Cooters! 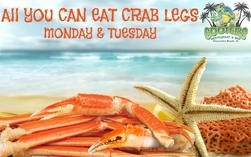 Tabelog chooses Cooters Restaurant & Bar as their first pick for All You Can Eat Crab Legs! Cooters Restaurant & Bar on Clearwater Beach. What a great place! It's Grouper Week at Cooters Clearwater Beach! Cooters, with its large open bar and wide, salubrious outdoor deck, mixes it up a little, offering .79 cent oysters, .65 shrimp and wings from 3 to 6 p.m. daily. Then there's a late happy hour with discounted libations from 10 p.m. to 1 a.m. 423 Poinsettia Ave., Clearwater Beach; (727) 462-2668. 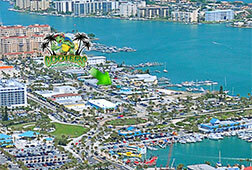 Visit Cooters during Clearwater Beach Restaurant Week. 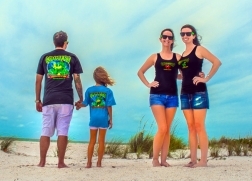 Clearwater Beach, FL - Proceeds from a raffle held during Cooters Raw Bar & Restaurant's 14th Anniversary Party were donated to the Clearwater Marine Aquarium's Turtle department. Pictured below (left to right) are Clearwater Marine Aquarium's Rebecca Snowden and COO Jody Armstrong receiving the $1220.00 donation from Cooters' manager Jeanie Roush, and owner Carol Mears. Cooters Raw Bar & Restaurant is holding their second annual canned food drive to benefit Tampa Bay Harvest, a non-profit organization dedicated to providing food to the hungry.